Convicted lynchers can get bail, why not under trials ? One of the famous political philosophers, Montesquieu, in his 18th century book “The Spirit of the Laws” wrote that “There is no greater tyranny than that which is perpetrated under the shield of the law and in the name of justice.” The quote holds true especially in the context of 21st century India. Recently, Jharkhand was in news for all the wrong reasons when a serving union minister of BJP, who also happens to be a Harvard graduate, felicitated and garlanded eight convicted murderers in a public ceremony. One can only wonder that if eight “convicted” murderers can get bail, what about the majority of Dalit and Adivasi undertrials who have been languishing for years in the prisons of Jharkhand ? The government’s penchant for arrest and bail is peculiar. It has been a month since the brutal attack on noted social activist Swami Agnivesh in Jharkhand, yet no arrests have been made so far. while anyone who so much as whispers that ‘the emperor wear no clothes’ is slapped with sedition. This includes a list of 20 activists who have been the Jharkhand government on its various excesses, labour organisations protesting against land laws amendments and the huge number of adivasis, dalits and other backward classes who have been trapped in false cases whenever they have dared to assert their constitutional rights. It is an opportune time to throw light on the condition of undertrials in Jharkhand, away from the light and glare of national media and civil rights organizations. One of the major findings of a study of undertrials in Jharkhand titled “Deprived of rights over natural resources, impoverished Adivasis get prison” highlights that tribals and dalits branded as Naxals, have been booked under the draconian UAPA act and the major anti-state sections of the IPC. The study conducted by Bagaicha, a social action centre, examined 102 case studies of people put behind bars for their alleged Maoist links. The report found that 98% of those arrested as Naxalites had no involvement whatsoever with the movement. Only two of them accepted (to the interviewing research team) they had any relation with any of the Left-wing extremist groups. The rest arrested asserted that they had been wrongly framed and arrested. Another study by B.I.R.S.A on extremist activities in Jharkhand and their impact on civil society concluded that, the number of undertrials in Jharkhand prison are on a steady increase. In most cases, the police has been unable to complete framing of charge against them. The problem of undertrials in not of Jharkhand alone. 67% of people in Indian jails are undertrials — people not convicted of any crime and currently on trial in a court of law. However, according to the latest NCRB Prison Statistics 2015, Jharkhand has the fourth highest number of undertrials staying in one of the worst conditions. An alarming 77.1 % of Jharkhand prison population consists of undertrials, most of which are dalits, tribals and minorities. For every 4 inmates, 3 of them are undertrials in Jharkhand. The percentage of under-trial prisoners stands as 29% Scheduled Tribes (STs), 32% Other Backward Castes (OBCs), 22% general and 17% Scheduled Castes (SCs). The proportion of ST and SC undertrials are disproportionately higher while considering their respective share in the total population of the state. ST’s constitute the highest number of prisoners (undertrials plus convicts) incarcerated in various jails of Jharkhand. 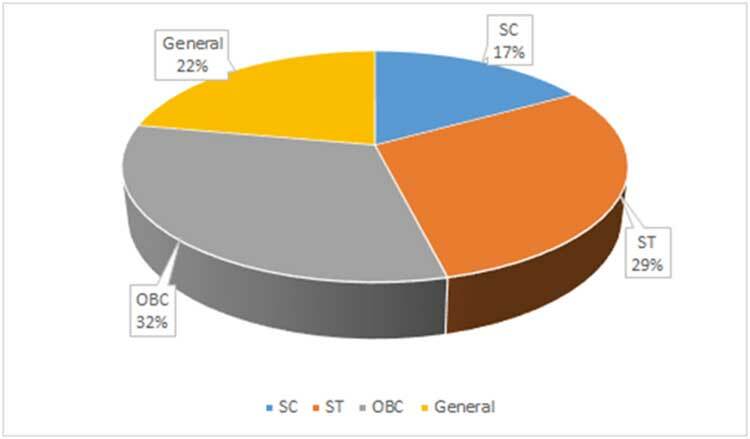 The total number of SC and ST behind bars (46%) is more than their total percentage population (38%) in Jharkhand. Figure 3 : Percentage of Undertrials under specific age groups. However, it’s not only Adivasis and Dalits, Muslims and Christians undertrials are also overrepresented in prisons across Jharkhand, when data from NCRB prison statistics is compared against their population in Jharkhand. Collectively, these two groups form a population of 19% with a share of 14.53% and 4.30% respectively according to 2011 census, but their share in prisoners, both convicted and undertrials is larger than their share in country’s population. Despite Supreme Court’s order on conducting speedy trials , Jharkhand seems to be in no hurry to act. States have the primary role, responsibility and authority to change current prison laws, rules and regulations. The state must bring back its focus on the cardinal principle of criminal law in India where bail is the rule and jail the exception ! Sania Mariam is an associate consultant with the Policy & Development Advisory Group, a policy firm based in Ranchi and New Delhi.